Coca-Cola: Promoting the Registered Dietitian? Photographs like this one — taken at last year’s Academy of Nutrition and Dietetics’ Food and Nutrition Conference & Expo — are the epitome of misguided partnerships with the food industry. By claiming to “promote” the Registered Dietitian (don’t ask us how), Coca-Cola can position itself as part of the solution to the very problems they had a direct hand in creating. Meanwhile, AND loses credibility and trust, both from the public and other health professionals. It is precisely this sort of messaging that makes it very easy for AND to be perceived as a laughing stock (yet, strangely, AND fiercely defends these partnerships as “science-based” and helpful to the profession). Sugar can not be blamed for obesity and/or any chronic diseases (never mind that soda is 100% sugar, and a can of soda provides 150% of an adult woman’s daily added sugar limit, per the American Heart Association). Physical activity is the key to health (a message the food industry loves, as it deflects blame from them and places it squarely on consumers’ shoulders). 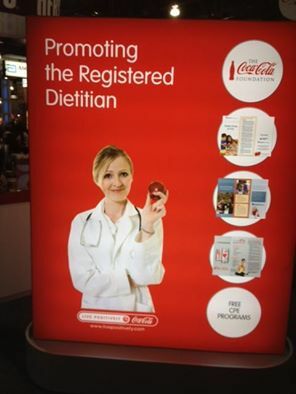 Dietitians do not need to be promoted by Coca-Cola. Dietitians need to promote healthful lifestyles to a population that is already saturated with deception and endless marketing from the likes of Coca-Cola.